Goes without saying that it's too early in the season to be making any firm judgments on where teams will finish the season. Too many twists and turns left in this MLS season. I mean, 2015 league rules are not even posted yet and the CBA hasn't been ratified, not to mention that getting that one right player this summer (New England's Jermaine Jones) can get you to the MLS Cup Final. Still though. We can look at how good teams are right now, at this very moment! Even though going we are going into week 6 (?) and have a couple teams with only 3 games played. Observing the league over the years I've learned that most things in MLS have to be looked at generally. 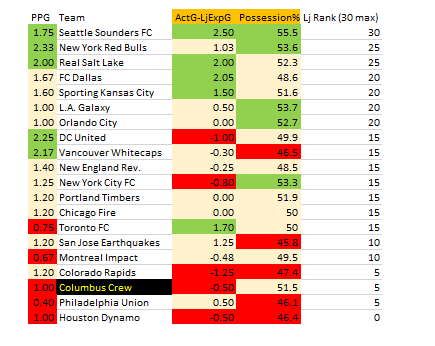 Like; Generally, Columbus likes to control possession. Generally, Seattle finishes their chances. So what I've done here is look at just that. Possession and Finishing, and sprinkle in actual results to separate the teams. Twenty teams in the league this year so we have nice even numbers. Let's separate into three groups. 1st up, let's make sure of the relationship possession has to this year's results. Next is finishing. Generally speaking in MLS teams score 1 goal for every four shots on target. This is a very dirty way to do this but if you look at how many goals per game a team scores against that measurement it matches up pretty well with results. Meaning; out perform the 1 goal per four Shots on Target and you, obviously, are higher on the table. On my image this is ActG-LjExpG (which is just a sloppy Actual Goals - Larry's Expected Goals). Lastly are results. Sort of self explanatory here. To get mere where I want to be I'll assign ten points to being in the top five... 5 points for the middle ten... 0 points for bottom five. Towards the bottom is Crew SC. They aren't finishing their chances at a good rate. It's dogged them last year as well. It's actually one of the reasons Kei Kamara was brought in. If Vancouver hadn't made a couple mistakes Wednesday, this would look even worse. I would expect this to improve as season chugs along. Not trying to change the world here, just painting an early season picture. I like to do this to later on in the season I can check back to compare. Have a great Saturday! Thanks for reading.